We recently wrote about the use of fans to stay cool in hot weather. 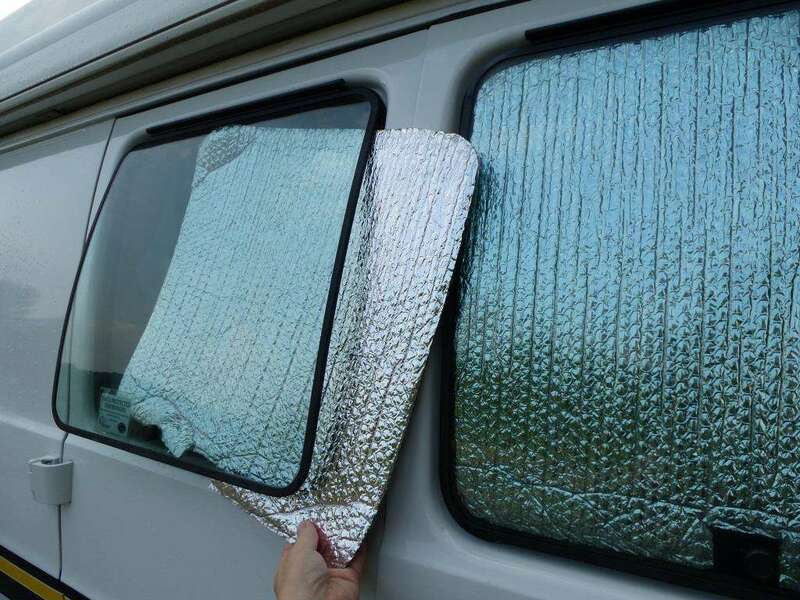 And in the past we've mentioned the value of Reflectix – that wonderful insulation that looks like reflective silver bubble wrap – for keeping warm during cold winter nights in our Roadtrek. Reflectix is equally valuable for keeping cool on hot sunny days. The greatest source of heat when the sun is shining is the windows. The heat load can be so high that your air conditioner may be unable to cool your camper down to a pleasant temperature when the sun is beating on it. There are several things you can do to help out your A/C unit. The front window is the biggest, so deal with it first. We just bought a reflective folding windshield shade from a Walmart auto department to fit. It doesn't have the insulation value of Reflectix, but it folds, easier to store since the window is so large. But you can help out more by using an outside cover when possible. We got two wrap-around covers that cover the front and door windows from the previous owner of our Roadtrek. One was a vinyl mesh material which lets in some light, and allows you to see out (see photo), and also a solid vinyl cover. The mesh cover is our favorite. It helps reduce heat – though not as good as the solid cover – but the advantages of letting in light and allowing us to see through it is worth it. And if it is letting in too much heat we can add the reflective sunshade behind it. We also have pieces of Reflectix that fit in the passenger and driver door windows. Next is the two side door windows. We cut these pieces of Reflectix to fit between the window and the screen with a notch for the window hinge. To install we open the window and slip them in from the outside. And if desired the window can be left open with the Reflectix in place. They make a huge difference if the sun is shining on the passenger side of the vehicle. This approach of putting the Reflectix between the window and screen could work on the big Dodge rear window, but the convenience of inserting from inside is nice. This should work for the Chevy dual rear windows. As mentioned with winter camping, cut Reflectix to fit your rear side windows. Trim carefully to fit and they will stay in place. We also cut a piece of Reflectix for the large back window to fit between the vertical curtain tracks. The Dodge Roadtrek has one big door on the back with a single window – wonderful for views. We usually have Reflextix in the kitchen window all the time. Actually it is two slightly overlapping pieces so we can “open” half of the window as desired. If you have a Sprinter that would account for all your windows. But for those of us with Dodge and Chevy vehicles, we are blessed with three more windows! Three Little Windows is not just the name of Mark Sickman's song about Roadtrek travels, those three little windows are also a source of a lot of heat on sunny days. The early Roadtreks had no covering for the windows, then Roadtrek added curtains, and more recently little covers for each window. Our Roadtrek has the curtains. The poor Roadtrek sprinter owners will never know the pleasures of light through their three black decals! We got into the habit of storing the Reflectix for the door windows under the curtains. It was a convenient storage spot, but then we couldn't enjoy the light and the view out those windows. And since they didn't fit tightly against the windows there was still a lot of heat getting in. It wasn't until we saw Loren Phillips' beautiful 1994 Roadtrek that we saw the perfect solution. He had made Reflectix covers, by cutting pieces to fit perfectly and then holding them in place with a small metal rod held with mirror clips. A trip to the hardware store provided brass rods and mirror clips. We had to file the back of the plastic clips a bit for them to sit correctly on the metal window frame. They do a nice job of keeping out heat (and light) when in place. Lastly there is the Fantastic Vent Fan to consider. Obviously it needs to be open if you are trying to cool without A/C, but if you are running the A/C there is a significant heat increase directly under that opening. Like for winter camping, you can put a piece of Reflectix over the frame held in place with mini bungee cords (see photo here). Others have reported having some special UV reducing window tint installed that is not dark but does help with heat. We have not looked into that yet, but it would be nice not to loose the views when it is 95 degrees outside. If we are not using A/C there are slightly different needs. Fans are extremely important (article here). We do make use of our extra awnings for that if we are staying in one spot for several days. The awnings are especially valuable if you are trying to cool with fans rather than A/C since some windows must be open. Sometimes it takes everything you've got to stay cool. We put it all across the back door and windows, under the curtains and hold it by tucking between the doors and the bed for winter camping and store it rolled up under the bed when on the road. Kept us nice and toasty. We have three skylights. Two have folding RV curtains and we use that to keep a sheet of reflectix in place. The third is in the shower and the interior plastic is flush with the ceiling. We use good ol’ dict tape to hold a piece of reflectix there. It makes a tremendous difference in hot weather. prepping my 92D190I for burning man—RV commenters say to put the reflectix on the outside of the vehicle–(with painters tape)–because once the heat gets in through the window pane youve already lost a good amount of cooling. Thoughts on that? Obviously inside is better for permanent, weather proof insulation, but this is one week of survival.